A global team of 65 scientists, including nine from the University of Georgia, have decoded some of the secrets to the crop’s coping strategies. The newly sequenced and decoded pearl millet genome, published Sept. 18 in the journal Nature Biotechnology, will help crop breeders create more drought-tolerant millet and develop climate adaptation strategies in other important cereal crops. This research used the latest innovations in DNA sequencing and analysis to identify new genetic tools, like molecular markers related to drought and heat tolerance, as well as other important traits, such as nutritional quality and pest resistance. The project was co-led by the International Crops Research Institute for the Semi-Arid Tropics (ICRISAT) headquartered in India, BGI-Shenzhen headquartered in China and the French National Institute for Research for Sustainable Development (IRD). Pearl millet is grown on about 66.7 million acres worldwide and is a daily staple for more than 90 million people, many of whom are among the most vulnerable in arid and semiarid Africa and Asia. It is also an important source of animal feed and forage for millions of farms. However, pearl millet yields have remained low over the last six decades, as this cereal is primarily grown in poor soil conditions without irrigation and minimal to no fertilizer or other agricultural inputs. Investment in genetic research for this smallholder crop has been limited, and breeders have had limited genetic information to develop high-yielding, superior varieties and hybrids that respond to farmers’ constraints. 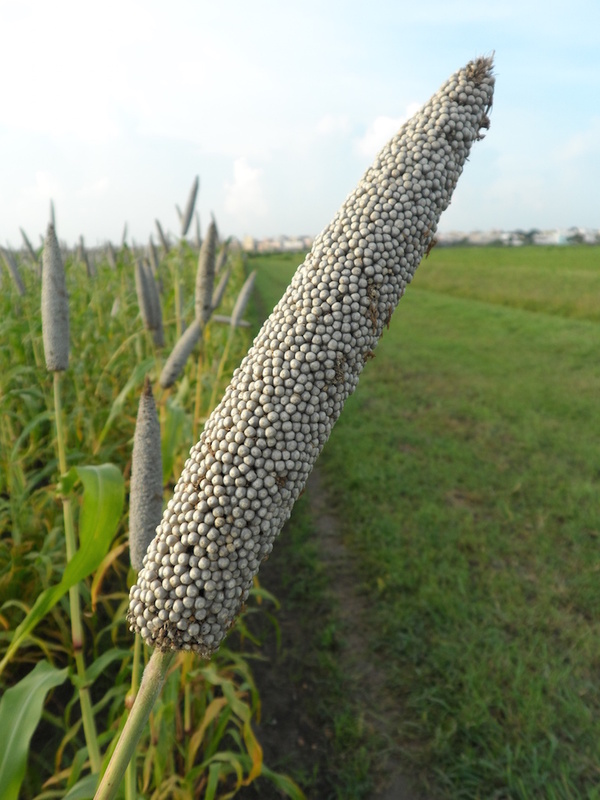 This pearl millet genome research has led to a better understanding of its genetic variability. Researchers have identified candidate genes for very important traits, such as resistance to downy mildew, a very damaging millet disease, and pearl millet’s exceptional heat tolerance. Such heat resistance is crucial as climate experts forecast further heat waves in years to come. Understanding the basis of pearl millet’s heat and drought tolerance could also help improve these traits in other crops, either by advanced breeding or biotechnology. Researchers in UGA’s Department of Genetics, Department of Horticulture, Department of Crop and Soil Sciences, Department of Plant Biology, the Plant Genome Mapping Laboratory and the Institute of Plant Breeding, Genetics and Genomics lent their specialized expertise in the millet genome sequencing. Professor Jeff Bennetzen and postdoctoral researcher Hao Wang, of the Department of Genetics, provided analysis of transposable element composition and distribution in the pearl millet genome. Professor Katrien M. Devos, of the Department of Plant Biology, the Department of Crop and Soil Sciences, and the Institute of Plant Breeding, Genetics and Genomics, generated a framework genetic map and conducted the comparisons between pearl millet and foxtail millet that were used to improve the assemblies. Professor Peggy Ozias-Akins and Assistant Research Scientist Joann Conner, of the Department of Horticulture and the Institute of Plant Breeding, Genetics and Genomics, helped annotate the pearl millet genome sequence with data from reproductive tissues. Professor Andrew Paterson and Associate Research Scientist Xiyin Wang, of the Department of Crop and Soil Sciences, the Department of Genetics, the Department of Plant Biology and the Plant Genome Mapping Laboratory, studied the evolution of the pearl millet genome in comparison to other cereal crops. Assistant Professor Jason Wallace, of the Department of Crop and Soil Sciences and the Institute of Plant Breeding, Genetics and Genomics, led the work to convert the initial, short genome fragments into long assemblies using data from pearl millet plants contributed by collaborators in Georgia, India and Africa. Postdoctoral researcher Peng Qi, of the Department of Plant Biology, the Department of Crop and Soil Sciences and the Institute of Plant Breeding, Genetics and Genomics, assisted with the generation of a framework genetic map and conducted the comparisons between pearl millet and foxtail millet that were used to improve the assemblies. The team’s publication on the pearl millet genome can be found at www.nature.com/nbt/journal/vaop/ncurrent/full/nbt.3943.html . Details about this research are available at ceg.icrisat.org/ipmgsc/.